TU history professor Michael Birdwell in front of the statue of Alvin C. York located at the state Capitol. 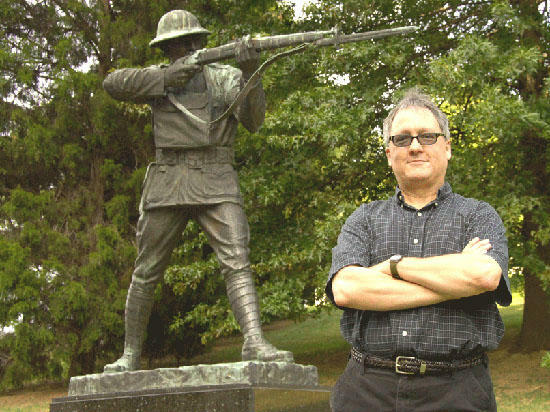 COOKEVILLE – Michael Birdwell, the world’s foremost authority on World War I hero and Fentress County native Alvin C. York, says he has renewed hope that the original structure built for the York Institute can be saved. The York Institute’s status on the National Register of Historic Places has been raised from statewide significance to national significance, thus making it eligible for a variety of grants that may save it. The York Agricultural Institute was built in Jamestown by York after his heroic service in World War I. York literally dug its foundation, sawed lumber, nailed planks and more during its construction. The original two-story brick administration building opened in 1927. The Congressional Medal of Honor recipient with a third-grade education said his experiences in Europe during the war made him realize the importance of education. With the notoriety he acquired as a war hero, York sought to improve the lives of people in the Upper Cumberland through education. Many know of York through the 1941 movie “Sergeant York” starring Gary Cooper. Few know what he did for education in the Upper Cumberland after the war. Birdwell writes in a just-published issue of “The Tennessee Conservationist Magazine”: “York’s post-World War I focus on improving education in the state is an important part of his legacy that is not as well known…The York Agricultural Institute was the focus of York’s effort to improve the welfare and education of people in Fentress County. The article, co-authored by Tennessee Historical Commission preservation specialist Claudette Stager, recounts both the financial and cultural difficulties York faced in establishing and operating the institute. Work to save the building has been almost as miraculous as was York’s capture of 132 German prisoners in France’s Argonne forest in October 1918. The last extension courses provided by TTU were taught there in 1990. By 2008 the building had fallen into such disrepair that the state Department of Education decided to raze it. But the state signed an agreement with the Sergeant York Patriotic Foundation that year, and the foundation agreed it would stabilize the building and eventually restore it. The building was stabilized and hazardous materials were removed by December 2009 at a cost of $1 million. The foundation now seeks to raise $4 million to rehabilitate the building and return it to its original mission: education for the people of the Upper Cumberland.